For the first time this was a My Fair lady which kept up the pace, and in this wordy musical it can slow down. Also contributing to this was the exceptional band and Musical Director Christopher Fossey making this an interesting and exceptional production which held us spellbound in the story. Being heavy on dialogue this is so important, however, all the actors brought light and shade to their excellent roles and brought intense interest. 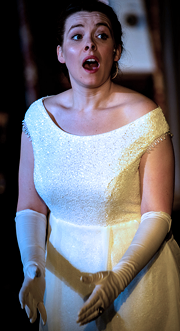 I have seen many performances and performed Mrs Eynsford-Hill, so easily compare! Concept Players have the skills to make each scene come alive and there was some excellent ensemble work and creative choreography that enhanced this production. What an Ascot scene! Classic black and white. Couture to die for! Eliza Doolittle is such an iconic role so many famous names have taken it to the stage , Fern O'Brien-Grant certainly did it justice with a lovely portrayal of the Cockney sparrow and transition to a lady, a delight in every scene. Shane Rose-Goodsir as Professor Higgins triumphed in this role, giving a polished performance and managed to give us a glimpse through the character's stiff upper lip breeding to reveal his frustration and underlying love and passion for Eliza, at last a new approach, brilliant! Great to have a Scottish accent and with his rich voice as Colonel Pickering, Ruairidh Macleod-Lyon played this character very well. A perfect rough and ready Alfred P Doolittle from Neil Davies gave the Professor his philosophy on life and sanghis rousing songs well. Mat Hole made a flesh and blood character of Freddy Eynsford-Hill, his voice was superb and Helen Windsor gave Mrs Pearce a colourful character. Poise and elegance was Mrs Higgins by Judy Harrhy. Outstandingly constructed set made for effortless scene changes, technical expertise and creative design apparent. Director, Paul, MD, Christopher and Adam, the Choreographer, and team deserve their accolade. This special production was very well received by an appreciative audience. "a lovely portrayal of the Cockney sparrow and transition to a lady, a delight in every scene"
"Shane Rose-Goodsir as professor Higgins triumphed in this role, giving a polished performance"
"Outstandingly constructed set made for effortless scene changes, technical expertise and creative design apparent"
"Director, Paul, MD, Christopher and Adam, the Choreographer, and team deserve their accolade. 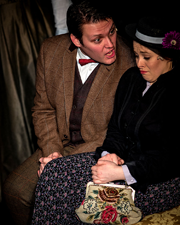 This special production was very well received by an appreciative audience"